While it hasn’t been scientifically proven, we’re fairly certain everyone looks good in white. With this logic in mind, we rounded up the best white tops all under $35. Scroll down to cop one or two for yourself—at this price, why not? On Julie Sarinana of Sincerely Jules: Anine Bing Leather Biker Jacket ($999); Joie top; Ralph Lauren Denim & Supply Oceanside Boyfriend Jeans ($125); Karen Walker sunglasses. Wouldn’t this top look darling with a denim midi skirt? Has there ever been a prettier pairing than faux leather and lace? A flattering top with an appealing bohemian vibe? Count us in. This isn’t your grandmother’s crochet. 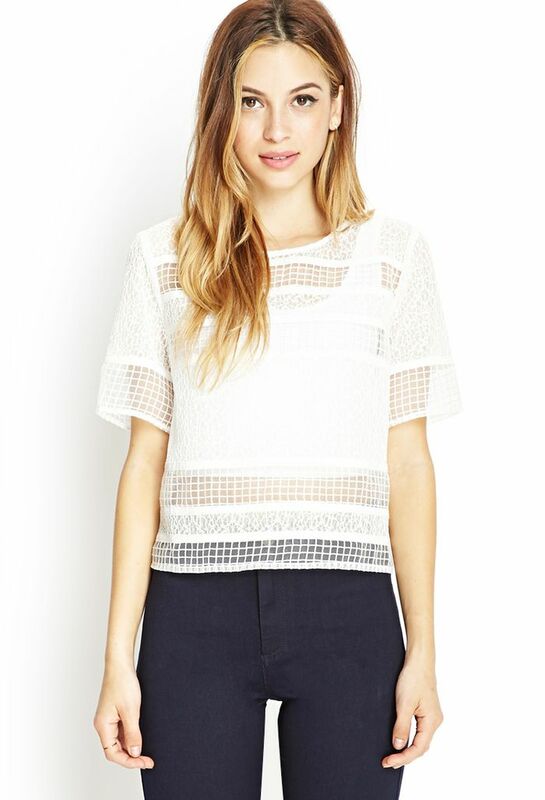 We think this lace top would make get along famously with your favorite cut-off shorts. This boxy top walks the line between classic and contemporary. This darling crop top costs about the same as your fancy salad, just to put things in perspective. Which one will you be adding to cart? Let us know in the comments below!